Greenhouse plastic films, co-extruded transparent PE films, offer durable and cost-efficient cover for greenhouses to cultivate and protect fruits, vegetables, and flowers. Whether at home (garden) or on an industrial scale, growing food or gardening require a cost-effective greenhouse cover to ensure the right insulation, light, and cover lifetime. Greenhouse polyethylene films co-extruded in 3 layers can be customized to climate conditions, applications and customer requirements. Ideally suited for vegetables and flower crops, greenhouse PE films are usually offered in clear, white, or yellow-green. The lifetime of plastic greenhouse covers can vary: 3, 6, 9, 12, 21, 24, 33, 36, 44 or 48 months. Read more about additives for greenhouse plastic and their benefits. 10 Reasons to Use Greenhouse Plastic Cover? 1- Optimized optical properties: sunlight management, from high light transmittance to high light diffusion in PAR (Photosynthetic Active Radiation) range, enhancing plants growth under difference climate conditions. 2- Minimized temperature fluctuation: Reduces temperature fluctuation between day and night creating the best environment for plants biological growth, leading to a decrease in cost of greenhouse heating, throughout the year. 3- Cost-effectiveness: compared to other laying materials, Polyethylene greenhouse film is the least expensive way to cover greenhouses, coupled with high efficiency. 4- Optimized mechanical properties: Offers adequate protection against weather conditions: heavy rain, snow, wind, under all climate situations. 5- Light-weight: flexible film, delivered in roll shape, special folding, providing easy handling and installation. 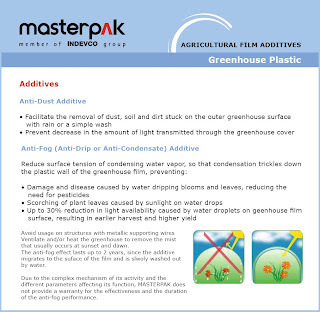 6- Customizable: Film design using the adequate additives and masterbatches, to respond to all growers’ requirements, application and climate conditions. 7- Pest control: using adequate film formulated to control disease and fungal proliferation under the greenhouse in IPM (Integrated Pest Management) application. 8- Better quality & uniformity of crops: Enhanced plants environments conditions, improving crop growth and harvest quality, to collect healthier products. 9- Earlier and longer harvest period: Offers out of season cultivation, through year-round production of vegetables, flowers and fruits crops. 10- Natural environment: special UV Stabilizer additive regulating the UV rays inside the greenhouse which stimulates natural pollination by ultraviolet-sensitive bees, bumblebees and other insects.